We have the first confirmation of other Legendary Pokémon besides Mew being obtainable through quests! You can receive quests from PokéStops. A PokéStop will give out the same quest to all players, and this quest changes daily. You can discard quests. You can receive the same quest again from the PokéStop you originally got it from. As announced before, doing one quest a day earns you a stamp. You get a better reward for obtaining seven stamps. These rewards will often be better items, but can sometimes earn you an encounter with Legendary Pokémon such as Moltres, as seen below! 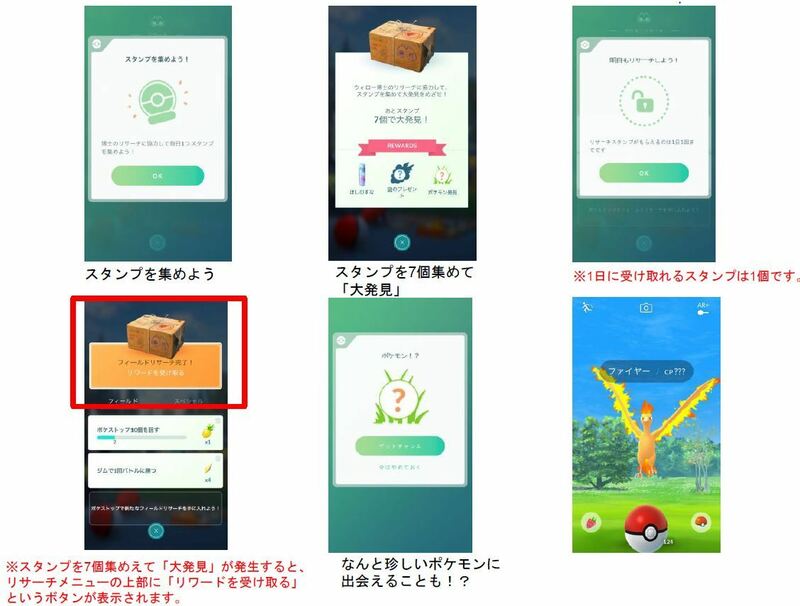 A special research quest will also run involving Mew. By undertaking various quests with Professor Willow, “everyone will be able to follow the mysterious figure of Mew”. These quests will supposedly get harder as you progress. “Special Research” is available to those with Trainer Level 5 and above. The quest to find Mew can be challenged by each trainer only once. What are your thoughts on these findings? Thanks to Cherrim for the translation and Ho-Oh for the tip. bobandbill is a staff member on The PokéCommunity forums, and an avid Associate Editor of PokéCommunity Daily. He likes discussing and writing about Pokémon on top of playing the games. He is not, contrary to popular belief, two people.